It was summer 2012 and Blaze Head Coach Paul Thompson decided his squad needed to toughen up. A season just passed during which his team had gone out of the playoffs at the quarter-final stage to bitter rivals the Cardiff Devils, the former GB boss recognised that British hockey was moving in a tougher, more physical direction. Despite the willing efforts of 5’11” scrapper Bryan Jurynec the year previous, Thompson knew he needed someone to go up against the likes of Adam Keefe, Gui Lepine and Chris Frank who had burst onto the Elite League scene. Thompson scoured the player market and found his man, an imposing 6’4” figure who at the age of 25 had already amassed over 1,500 penalty minutes in the WHL, ECHL and AHL. “The toughest guy in the league,” proclaimed Thompson on securing the signature of Canadian defenceman Benn Olson. "He was a different level to anything we had at the Blaze in terms of toughness, there was no one you could compare him to at the club at that time," recalled the now Sheffield Steelers Head Coach. During Olson’s first season in Coventry he registered a massive 392 penalty minutes, second only to Cardiff Devils' Brad Voth for most penalty minutes in a single Elite League season who clocked up 414 in 2009/10. "I remember my second regular season game with Coventry. I scored and thought I was going to be a goal-scorer for the season," joked Olson who in the end managed 4 in 82 games for the Blaze. "Kidding aside, it is quite a tough role to play mentally. I don’t think many understand it unless they have actually done it. Going into each game could be quite terrifying knowing that there was a chance I could be knocked out in front of thousands of fans." "Not in Cardiff though. That would be in front of hundreds of fans and (Devin) DiDiomete could only reach my shoulder pads so I was never too worried for those games." "There wasn’t one player I thought that about. I think I was one of the biggest guys out there my first season. I remember when I re-signed with Coventry, Thommo (Paul Thompson) told me that because what I did that season every other team was going to pick up a tough guy. And he was right with the likes of Matt Nickerson, Tim Spencer, Brett Henley and Leigh Salters coming into the league. I broke my finger and wasn’t able to fight most of that second season but I definitely would have needed to be on my game and watch out for those guys. Adam Keefe I would say though was definitely someone that I really respected and went to battle with a few times. Not sure how he does it but he always seemed to give me a bit of trouble in our fights." Olson’s ten year career saw him play junior hockey for the Kamloops Blazers and Seattle Thunderbirds before turning pro in the AHL as part of the Albany River Rats organisation. Over a four year period in North America, the tough guy attended the New York Islanders NHL training camp and was moved up, down and across the AHL and ECHL residing in cities such as Florida, Cincinnati, Bridgeport and Alaska before making the move to Europe. 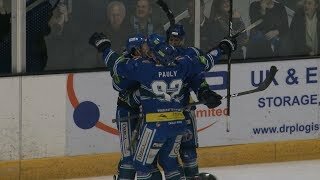 In what turned out to be his final as a pro, Olson played just 29 games in a second season in Coventry and despite enjoying his time working with UK TV subscription channel Premier Sports whilst not on-ice, the Canadian says he still holds some deep regrets about the way in which his final season was taken from him. "You spend a decade of your life dedicating everything you have to something and moving your family around the world and things end not on your terms like that and it is definitely disappointing. After my first surgery and the eight-week recovery was up, my finger still didn't feel right. I tried playing for a while and thought it would get better and finally said something is really wrong. Turns out the doctors that removed my pin either accidentally re-broke it when they were removing the hardware or it had never healed properly and they had just assumed it had. The doctors didn't do a final x-ray so we couldn't say for sure. So I had to go in for a second round of surgery because of this and was out for most of the season. I can't tell you how thankful I am for Nic (club physio Nicola Sherlock) and her help during that tough time." The big Blaze number 33 hung up his skates at the relatively early age of 27 but says that the pressure of his role was not something which led him to drop the gloves for good, nor was it necessarily a hockey related decision at all. "The enforcer role had no effect on my retirement. Although it was a tough job there was not a better feeling than having a good scrap in the Skydome and listening to the fans roar and giving them a little celebration before I went into the penalty box. "When I left Coventry I had planned on playing one more year of hockey before I retired and pursued a career in the fire service. I had signed on to play in California in the ECHL but some circumstances came up with my wife trying to become a resident in British Columbia (she’s American) that lead me to have to back away from hockey a year earlier than I had planned. Ultimately immigration Canada gave me a week to find a job in British Columbia or they would pull my wife’s application. The Vancouver Canucks weren’t calling so I decided to retire. "Hockey was such a big part of my life for so long. My retirement was a decision that my wife and I talked over and decided it was the best thing for us as a family. I know I could have played many more years of hockey but this was ultimately the best choice for us as a family and I wasn’t getting any younger." With the likes of Ryan Ginand who ended the season as the Elite League’s top goal and point’s scorer, and the highly skilled Henrich brothers in the line-up, Olson might have expected his final season with Coventry to end better on the ice too. "I think there was a lot of hype with the team coming into the season and I think a lot of people expected us to do better and I thought we had the team to be more successful than we were. I think the coaching change mid-way through the season affected us as a whole." Long-serving Blaze player and first-year coach Matty Soderstrom was replaced in February by Sheffield Steelers Assistant Coach Marc LeFebvre, a decision which Olson argues backfired with the Canadian taking the approach he did. "Marc didn’t show us respect when he took over and in return he wasn’t getting the respect back." On taking the job, LeFebvre was quoted as saying it was his way or the highway and in his opinion the Blaze squad had "got into a lot of bad habits," something which he sought to rectify. From Olson's perspective, he reflects: "Marc was publically bashing his own players on the local radio station, prior to the season even being final and all of us were around to hear about it. It just wasn’t an easy transition. You can’t have a group of guys want to play for you when you treat them a certain way. The EIHL is a big jump from the FHL (the Federal Hockey League where LeFebvre was awarded Coach of the Year with the Dayton Demonz) - I’m sure he’s learnt that." The current Dundee Stars Head Coach is quite open to suggestion that he took lessons from his Blaze experience and whilst remaining honest in his assessment, after also spending time in the Hungarian MOL Liga, many would argue the 33-year-old has quickly refined his methods and matured into one of the brightest young coaches and expert recruiters in the Elite League. "I know that the Blaze owners really wanted to do right by everyone," continued Olson. "They wanted to make changes for the good and worked hard to try and make it happen. Unfortunately, a few bad attitudes (in the locker room) just took up a lot of time and energy sorting out and it was hard to recover and bounce back from that. For me personally it was such a hard season because the morale was down but also because of my finger injury and being out for so long. I wish I could re-do that season but am thankful for the opportunities that I have now." Returning to happier times, Olson now 29-years-old is married to wife Kaitlyn and has a daughter, London who is says "are both doing great." "London is 17 months now and is growing and changing every day and I love every minute of it. Kaitlyn is working very hard, she is starting up her own business called Thimble and Pine creating kids toys and clothing as well and repurposing antique furniture. Blaze fans can check out her collection on Instagram: ThimbleandPine"
The Port McNeill native has also recently received good news on the job front, after being accepted into the Canadian Fire Service. "Firefighting has always been something I wanted to work towards as a career after my hockey career was finished. It’s a very sought after job in Canada and is quite hard to get into. Many friends I know have spent several years trying to get hired with no luck. I started working towards this in September 2014, so it has taken me well over a year and a half." Olson explains that his hockey background served him well to be accepted into position relatively quickly. "I am very fortunate that it has only taken me this long (to be accepted) but when I decided to do this I did everything I could that would give me the best chance to get hired as quick as possible. I approached it like I did hockey, I made sure I was the hardest working candidate there was to make sure I stood out from the other 400 applicants that were applying for only a couple of open spots. Teamwork is a big part of the fire service and I think having played at some of the highest levels in hockey for 10 years really improved my chances of getting hired"
Picking up on the point of teamwork, Olson says he still remains in touch with many names that he spent two years protecting on-ice. "Yes, actually I sent Cale Tanaka a message today. Other guys I chat with are Mike Egener, Mike Schutte, Adam Henrich, Gerome Giudice, Mike Zacharias, Russ Cowley and Matt Selby to name just a few. Shea Guthrie and I talk quite often too when he isn't no-showing for our dinner dates! He is the only one I have seen since I left Coventry. He lives about 40 miles from me and is the only one that lives close. James Griffin has helped me with my website for my hockey school (see here) and created posters for that too which has been a huge help. And then there’s you guys who text or Facebook message every once in a while!" 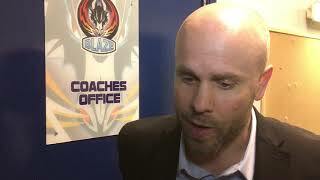 Having friends still on the current Blaze team and in the league, Olson says he still keeps an eye on results and goings-on in the league and concludes by expressing thanks to the Blaze fans and organisation who treated him so well. "I was really happy for the guys winning the playoff weekend two years ago and making it to the finals this past season. I have really nothing but great things to say about the owners and everyone else involved with the Blaze operations. My wife and I loved our time there and wished it had lasted longer but are happy with where we are now in life and will always be thankful for that experience." Whilst Benn Olson’s career with the Blaze was relatively short lived, the heavyweight champion left what was to be a lasting impression on the club and British ice hockey for sure.